I had originally photographed Jason's textbooks for this his/hers Friday, but his last final was yesterday (which he totally passed) and this will be the last of the summer breaks for my fella. So I chose not to spotlight the schoolbooks because schoolbooks are no fun after you have lived and breathed them for the past month and they make for a pretty boring photo too. So instead these are our books to read this summer summer summer time. I've been on a reading frenzy lately. When the day's done and I have sworn off the computer for the rest of the evening and Jason is studying I have been enjoying a good book or ten. I love good books, I don't love ok books or boring books, therefore I am a GoodReads junky. Love it for the reviews and seeing what friends are reading and enjoying.... it's a great resource. If you don't have an account, get yourself one and maybe we can even be friends. Jas has been jealous of my books over this last quarter (I think he may have been jealous of anything besides studying) so he's pretty pumped to crack open a few of his own and he's got himself quite a little pile! My two very favorites that I have read recently are These Is My Words by Nancy Turner (I have never cared for a character as much as I did reading this book, and I have never fallen in love with a character as I did in this book—so captivating, you just get caught up in the story) and The Help by Kathryn Stockett (loved this one! loved all of the characters, loved it all. and the movie comes out in August!!). What books have you read or heard lots about lately?? geri! will you please do a photography tips editing/settings..something! you are amazing! When I first saw the title of this post I thought, "OOO! I need to suggest The Help!" Because I just finished reading it tonight! I LOVED it. Thinking I'll read Water for Elephants or Sarah's Key next. I've heard great things about These Is My Words, so I'll add that to my list! Thanks for the suggestion! Yay! So I'm going to the library today and will have to pick up The Help. Jason is gonna love those Chronicles of Narnia books! I think I've read them all like 3 times each! I hope Jason likes the Narnia series! I read them a few years back and thought they were great! I read like one a day because they are such easy reads. They are such cute little stories! I'm reading the Hunger Games series right and now and am finding it hard to put down. My kids are raising themselves this week. Haha. P.S. You're such a cute person! I love that we're friends on goodreads, you have such great book suggestions! I loved The Help, the ending could not have been better! I'll have to add These Is My Words to my list. I'm reading "The Help" right now and LOVE it! I have a Kindle and it is a readers best friend! I'm totally with you on the whole not-going-for-just-okay-books thing. I just did a blog post on how I never read books that aren't highly recommended/award-winning/bestsellers; I was reminded of that fact when I went ahead and read a book that wasn't any of the above and was highly disappointed. Love the pictures! 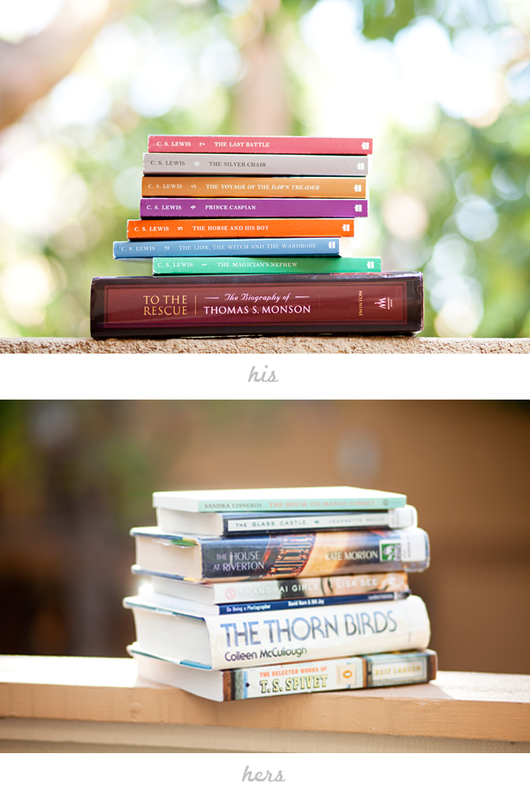 Such a creative way to do a book post!